This is a call-to-action for Venture Capital, Auditors, and the IRS to fix the burden on startups caused by IRS Code Section 409A. I start with three Calls-to-Action and follow with explanations. To: Venture Funds — Combine ASC 820 (FAS 157) with 409A. To: Auditors — Publish 409A valuation audit standards. 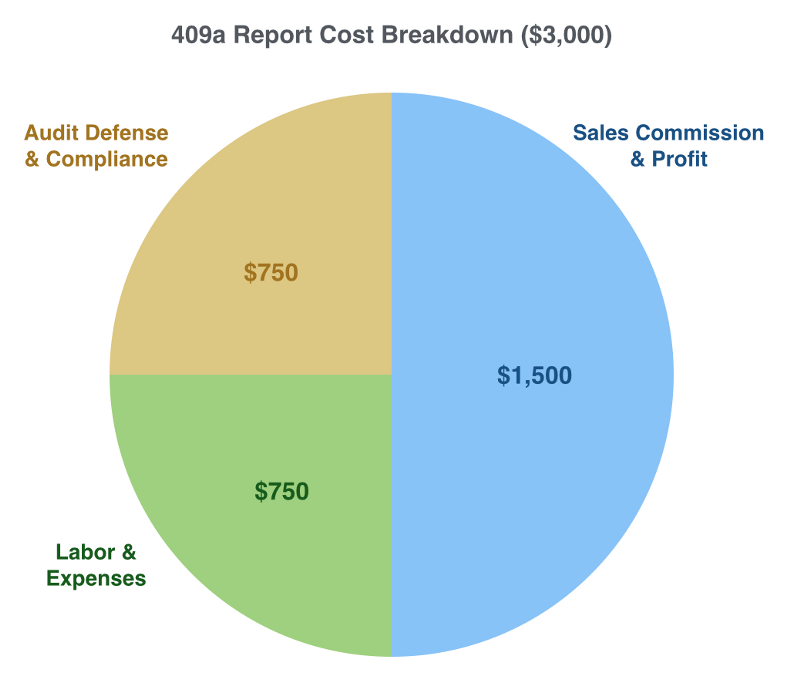 The largest non-sales expense of 409A valuation work is audit defense because each of you interpret the AICPA standards differently. Only four of you matter — Deloitte, KPMG, PwC, and EY. Convene your valuation-department-heads to a 409A Summit. Agree on consistent standards between you and publish them. I am happy to facilitate. Carta is the largest distributor of 409A reports in the US. We will enforce your rules across all of our valuation providers. To: Internal Revenue Service — Amend or prosecute 409A. I don’t believe IRS code 409A was intended to apply to startups (or small business) and their employees. The application of 409A to startups is an unintended consequence of a loophole between Statute 422 and Code 409A. I ask that you amend IRS Code Section 409A to provide an exemption for businesses with less than $10M in revenue. If I am incorrect and you did intend 409A to apply to startups, then prosecute someone. In the 10 years the code has existed you have never enforced 409A. Startups cannot assess risk because the code is ill-formed and you have not established case law precedent on applicability. Startups pay the maximum premium to insure an unknown event. I invite you to audit Carta and establish the first legal precedent. For those interested, I continue with explanations. ASC 820, formerly known as FAS 157, is the accounting standard for venture funds to report the fair-market-value of a portfolio. 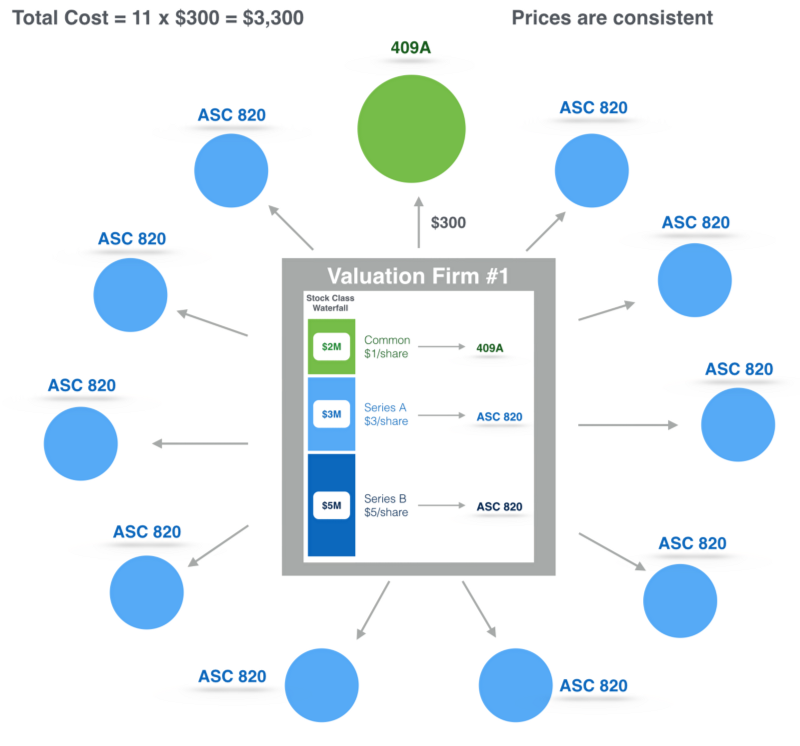 The ASC 820 and 409A valuation methods are identical. It is a two-step process. First, determine an enterprise value to the company usually based on a weighted average between a future cash flow analysis and a recent financing price. 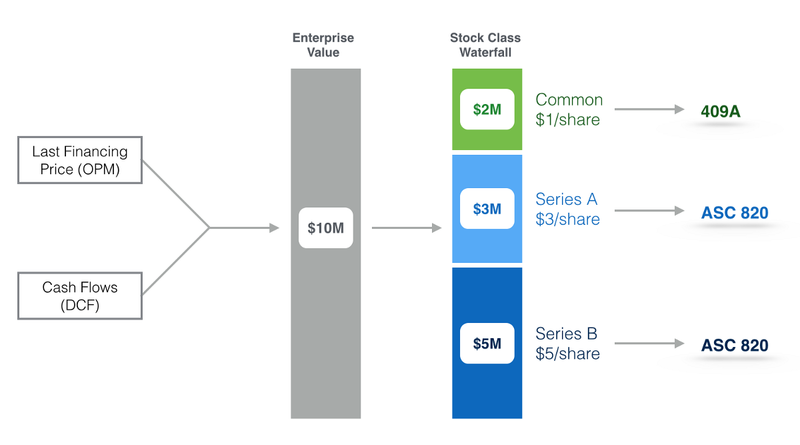 Second, use a Black-Scholes model and waterfall to allocate value across the different classes of stock. 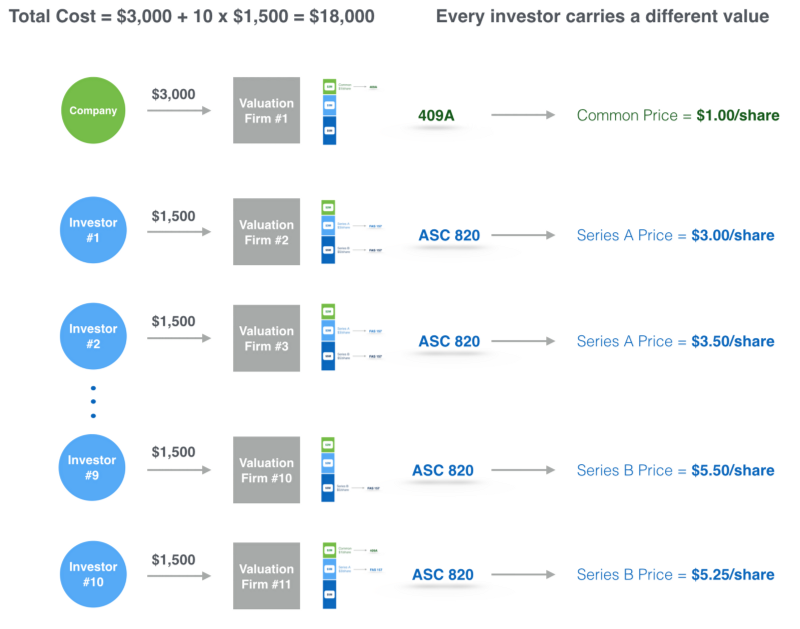 Any private company valuation, whether 409A or ASC 820, requires valuing every class of stock. The difference is ASC 820 reports the preferred stock price for investors and 409A reports the common stock price for the company. Say Company-X has 10 venture investors. Company-X purchases a 409A for $3,000. Each investor of Company-X independently purchases a ASC 820 valuation for $1,500. That means 11 different firms produce 11 different reports for the same company at a total cost of $18,000. It is wasteful. And though the models are identical the assumptions can vary so each venture fund reports a different price to their LPs for the same shares. A better way is for a single firm to value the Company-X once. Then sell the work product to Company-X (as a 409A) and each investor (for ASC 820). The valuation could cost $300 to Company-X (a 90% discount) and $300 to their investors (an 80% discount) and the valuation firm would make $3,300; more than any single firm did in the previous model. In addition, the fair-market-value of Company-X (and its share-price) will be held at the same price across shareholders. Surprisingly, this is sometimes a controversial statement. It should not be. LPs and auditors should insist on price transparency and consistency across funds. Fund incentives to inflate or deflate prices make this point even more important. It is nonsensical that VCs report different prices for the same shares, auditors approve them, and LPs accept them. In 2005, the year Section 409A was enacted, 409A valuations cost ~$25K. The price has declined as competition entered this high-margin business. The price will continue to decline and by 2018 it will be almost free to most companies. 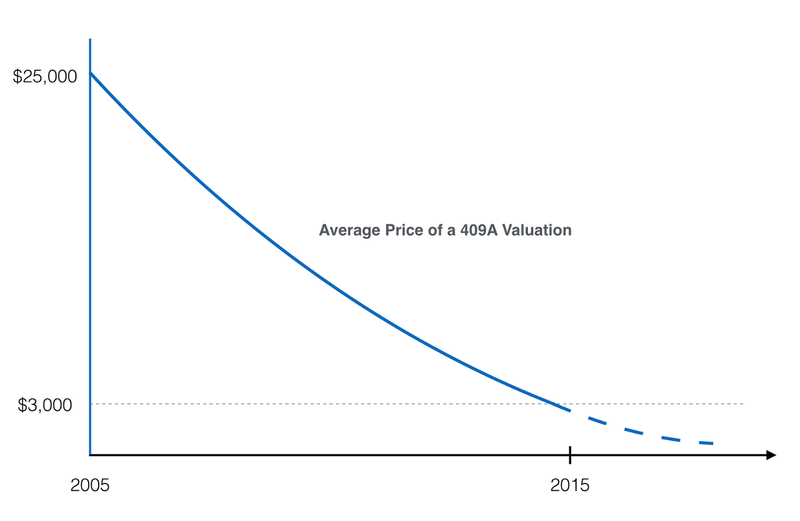 About half the cost of a 409A valuation is sales commission. The other half is split between the analyst doing valuation work and collecting reserves to pay for audit defense. This is usually handled by a partner or senior analyst so the time-cost is higher than basic valuation work. It is also the most uncertain part of the cost model because it is hard to predict. Since the company and auditor don’t pay for time spent defending the valuation, there is no cost for auditors to require rework of 409A valuations. And some auditors are paid hourly creating incentives to go back-and-forth on 409A valuations. The boom of small firms selling 409A valuation reports to seed stage companies has dramatically increased the variation in quality of 409A reports. The problem is the quality feedback loop is too slow. A new firm can sell valuation reports to seed stage startups for 2–3 years before their first report is audited. By then it is too late — there are hundreds of bad reports in the market. This creates a self-reinforcing cycle of systemic quality issues between firms and auditors. Firms that won business at the seed stage 2–3 years ago are getting caught by auditors and raising prices to pay for the defense and rework of old reports. That creates room for new entrants to undercut prices because their audit risk is still 2–3 years way. The cycle will continue until auditors move upstream and shorten the feedback loop. Carta can help in two ways. First, because we are a distributor and not a manufacturer of 409A reports, we can enforce standards on our partners. We already do this by vetting valuation firms with auditors as part of their application to work with us. But we can do more. If auditors provide us direct feedback on 409A report quality we can immediately enforce that feedback among our valuation partners. Finally, let me explain why we think IRS Code Section 409A was never meant to apply to startups. Section 409A was written in 2005 as a response to abuses of deferred compensation arrangements by Enron executives prior to Enron’s collapse. Section 409A only applies to deferred compensation. Contrary to common belief, ISO and NSO stock options issued at fair-market-value, even those options subject to vesting, are not deferred compensation and not subject to Section 409A. For the majority of startups issuing “normal” options, Section 409A does not apply. And to put an exclamation point on that statement, the authors of Section 409A specifically exempted ISO grants for employees. The reason startups are told to purchase 409A valuations is because of loophole between Section 409A and Section 422 which governs the tax treatment of ISO grants. The loophole occurs if the IRS concludes that a normal ISO grant was issued below the “good faith” FMV (Section 422 requirement) and converts the grant to an NSO (under Section 422). NSOs are not exempt and the delta between the strike price and the FMV is deferred compensation and subject to Section 409A. A 409A report is insurance for your second home that only kicks in if your first house burns down. That is an unnecessary and costly burden for startups that are still building their first home. Another argument that Section 409A was not intended for startups is that the penalty is against the optionee, not the company. This makes sense when the IRS is going after executives giving themselves illegal deferred compensation bonuses. But penalizing startup employees over an arcane fair-market-value methodology chosen by their employer makes no sense. If the IRS wants companies to comply they should penalize the companies. Startups should continue getting 409A valuations because case law has not been established. But the risk should be put in perspective. 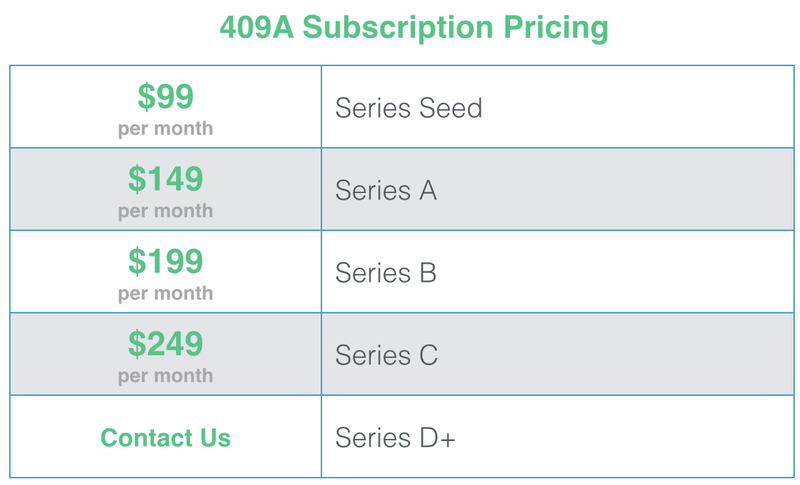 Early stage startups should not be scared into paying $3K — $6K for a 409A report. The IRS did not intend for startups to spend ~$50M a year on 409A valuations. The law and penalty structure doesn’t make sense. I hope the IRS amends the law to reduce the burden on startups. In the mean-time I ask auditors and venture funds to help in the ways I’ve outlined. The best solution is better legislation but there is still a lot we can do on our own.